A lot of folks are worried about Alzheimer’s and other forms of dementia. While deterioration in cognitive abiltity is a serious problem for many, it is important to understand that most memory glitches are not permanent nor are they progressive. In fact, many memory problems are caused by other things such as anxiety, depression, dehydration and other medical conditions and most importantly … are not indicators of Alzheimer’s disease. 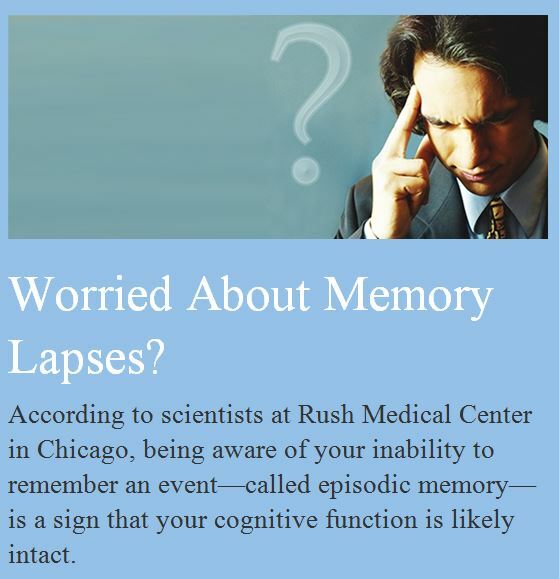 Recently there has been some good news for people who worry about forgetting things . According to the study, a person’s ability to know that s/he has forgotten something is a strong inidcator that that their cognitive aparatus is in tact. Nonethe less, if you are worried, the first thing to do if you have concerns about your memory or being forgetful, is to see your doctor. There are simple tests which can identify treatable issues which can clear up the problem and relieve your worry. Also, learn more about what dementia and other cognition impairing conditions and what is actually involved. Here is a helpful link which provides more detailed information about what your doctor will look for. :https://www.healthafter50.com/memory/article/what-is-dementia-what-doctors-check-for?